We learn a lot in our jobs, our careers, and our hobbies. But what happens when we change careers, change jobs, or get promoted - what skills are still relevant when we make that big move? We don't want to miss an opportunity, fail an interview, or take a job we don't know how to do. 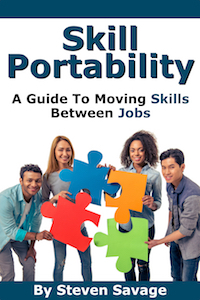 This book is your helpful, handy guide to Skill Portability. Using a simple four-sided system you'll learn to recognize what skills will be useful in your new career and why. From better resumes to better interviews you'll be ready to show people you know what you're doing. The Four-Part DARE System - Learn about the different kinds of skills you have and how they're relevant to a new career or job. Guides for hobbyists and professionals - Each part of the DARE system shows you unique strengths - and challenges - depending on if you've learned something for fun or on the job.